This recall is being conducted in cooperation and jointly with the U.S. Consumer Product Safety Commission. 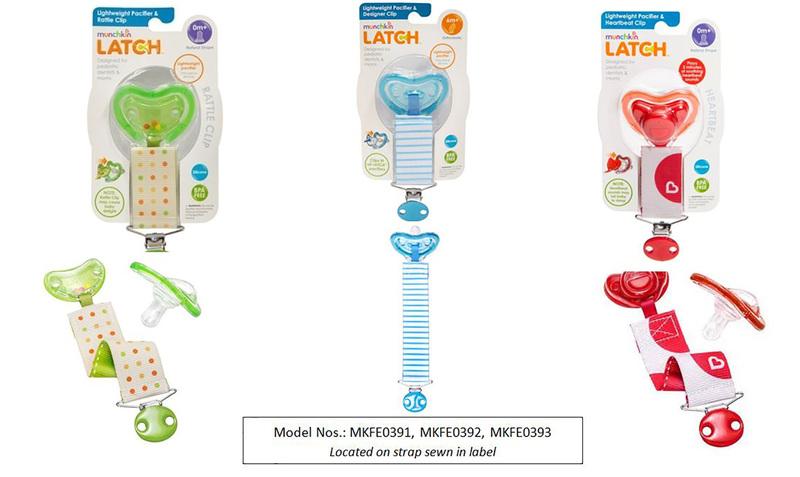 Munchkin, Inc announces the voluntary recall of the Latch™ Lightweight Pacifier & Clip assorted styles and colors sold as set. Hazard: Epoxy coating on the clip can weaken in certain environmental conditions and detach posing a choking hazard to small children. There have been no reported injuries, but the product is being voluntarily recalled in an abundance of caution. The Latch™ Pacifier & Clip meet all regulatory requirements. Remedy: Consumers should stop using the clip immediately and contact Munchkin, Inc for a replacement Latch™ Lightweight Pacifier – 2 pack pacifier. Consumers, who are not satisfied with the offer, will be able to receive a refund upon receipt of the entire product set.